Pewter whiskey glass features ornate letters I and P along with Celtic knot-work from the Irish Book of Kells manuscript. The Book of Kells was created by Irish monks around 800 AD; it is an ornately illustrated manuscript that contains the four Gospels of the New Testament. The Book of Kells is a national treasure that is displayed at Trinity College in Dublin, Ireland. This pewter whiskey glass features a Celtic design from the Book of Kells that is enhanced with knot-work along with the letters I and P. The Irish whiskey glass is a lowball or double old fashioned size that measures 3" wide at the rim and stands 4" tall; the 10 ounce glass is made of lead free pewter. The Kells whiskey glass is made in Ireland by Mullingar Pewter and it is gift boxed with a Celtic knot history card, complements of The Irish Gift House. Pewter whiskey glass features ornate letters E and T along with Celtic knot-work from the Irish Book of Kells manuscript. This pewter whiskey glass features an ornate letter Z along with Celtic knot-work from the Irish Book of Kells manuscript. 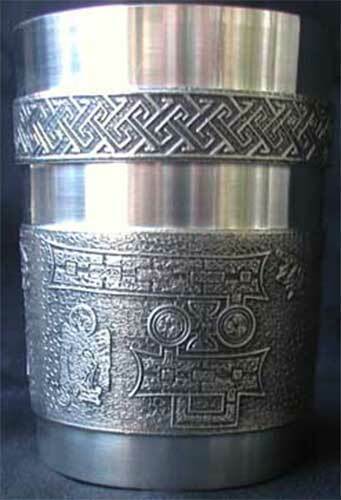 Pewter whiskey glass features an ornate letter T along with Celtic knot-work from the Irish Book of Kells manuscript.